The Arctic Explorer Icebreaker ship sets sail from Pitsundsbron near the city of Piteå Swedish Lapland. This coastal area of Northern Sweden is extremely beautiful in the winter time with crispy white snow, beautiful white pine tree forests and miles of frozen sea. The Icebreaker ship tour is a fun experience and a good opportunity for some photographs. The Ice breaking ship carves it’s way through extremely thick ice and you’ll hear the crushing of ice against the ship’s hull. This is the Baltic sea, frozen in winter and most probably frozen from northern Sweden over to northern Finland. 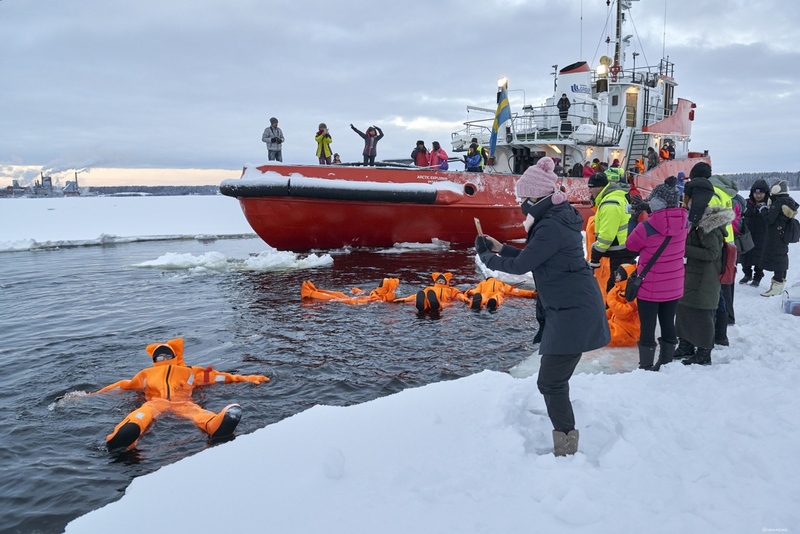 Along the way, the Polar Explorer stops to allow it’s passengers the opportunity to walk in the ice or even for people to experience some ice swimming! Don’t worry, the dry suits will protect you from the immediate cold, but do jump in (with a suit on) – What a great photographic opportunity for you, your friends and family to see. The Arctic Explorer will provide all of the equipment necessary for an ice swim. We’ll also stop for a well deserved hot drink on the ship. It was built in Finland in 1963. It weighs 332 tonnes and has a 6 cylinder engine. You’ll also be happy to hear that there is a little coffee on board where you can buy more hot drinks, sandwiches and snacks. Note you can select a rate with transfer from Brändön or Luleå or you can select on the Icebreaker without a transfer if you have your own transport. An icebreaker is a special purpose shipdesigned to move through ice-covered waters and provide safe passage for other ships. Although the term usually refers to ice-breaking ships, it may also refer to smaller vessels, such as the icebreaking boats. For a ship to be considered an icebreaker, it requires three traits most normal ships lack, a strengthened hull, an ice-breaking shape, and the power to push through sea ice. Icebreakers clear paths by pushing over the ice. The bending strength of sea ice is so low that usually the ice breaks without noticeable change in the vessel's trim. Because a buildup of broken ice in front of a ship can slow it down much more than the breaking of the ice itself, icebreakers have a specially designed hull to direct the broken ice around or under the vessel. The external parts of the ship's drive system (propellers etc.) are at even greater risk of damage than the vessel's hull, so the ability of an icebreaker to propel itself onto the ice, break it, and clear the debris from its path successfully is essential for its safety. The Arctic Explorer Icebreaker in Piteå is used to break up the ice in the Piteå harbour enablinhg regular ships to traffic the sea ways and for commerce to continue. It is also a great day out for our guests.